They sure are! And a lot of the best evidence we have for them comes from the centre of our own galaxy. With the telescopes we have now, we can actually watch individual stars zip around some extremely heavy, but physically small, completely invisible object. From the orbits of the stars, we can figure out how much matter the dark object must have. We also know how big it can be, since some of these stars pass very close to the mystery object, and aren’t being torn to shreds, so the object must be smaller than that. With the mass and the size, we can have a guess at the density of the object. If the density is way too high to be anything other than a black hole, then the only reasonable conclusion is that our mystery dark object is indeed a black hole! In the case of our galaxy, the weight and size of our central black hole is about 4 million times the mass of the sun in a space that’s less than the size of our solar system. The only way you can pack things that tightly is if you crush it to the point where the object has to be a black hole. We know that other galaxies have black holes too, so it’s not just that our galaxy is weird or special in some way. With really nearby galaxies, we can look at the way that the galaxy is rotating. (We can also do this with our galaxy, which gives us an extra data point.) If you’re trying to figure out how massive the galaxy is, if you don’t include a whole pile of matter right at the center (like a black hole), any model you create to try and reproduce the way the galaxy rotates just won’t work quite as well as if you included the mass of the black hole. We also have some pretty solid evidence for star sized black holes, not just the supermassive ones in the centres of galaxies. We’ve seen lots of stars that appear to be in a pair with a mostly invisible object (the invisible object sometimes glows in X-rays), and again, you can calculate the orbits of the normal stars and find the mass of the object it was going around. Again, you’ll find that the only object that we know of that can pack that much mass into a small space is a black hole! 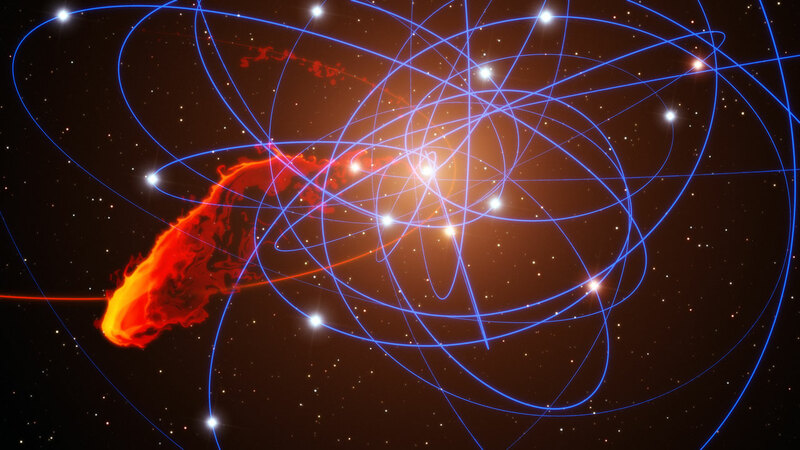 So yes, black holes are very real, and they’re everywhere. Have your own question to ask, or something here unclear? Feel free to ask!